Today and weekend days are more emphasized. Periods in which unit type is sold out are highlighted, or where availability of a unit type is zero. Unit types filter - if you manage a larger property, scrolling to the bottom of the calendar just to find a certain unit type, can be time-consuming. With the new filter, this problem is solved because you can temporarily hide unit types that you do not need to look over at a particular time. E.g. With this functionality, you can easily have Double Rooms in your property displayed on the calendar. 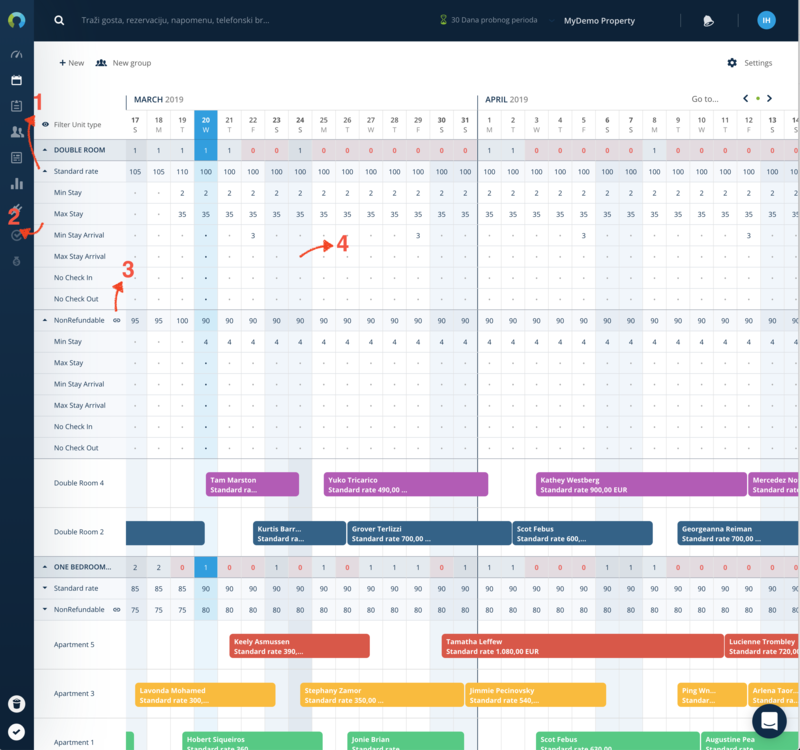 It is possible to select three levels of rows density on the calendar. Larger properties will now be able to see more accommodation units within one view. Define the data you prefer to see on your reservations. Pick and mix the data combination you wish to be displayed on the reservation in the calendar (e.g., in the upper row choose to show the guest's name, and in the lower one price and the rate plan). 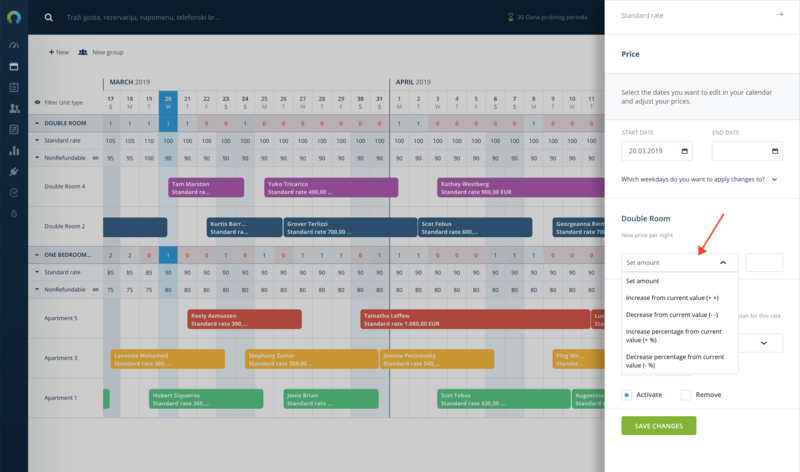 It's satisfying to announce that now you can observe your bookings in different colors depending on the check-in / check-out status. 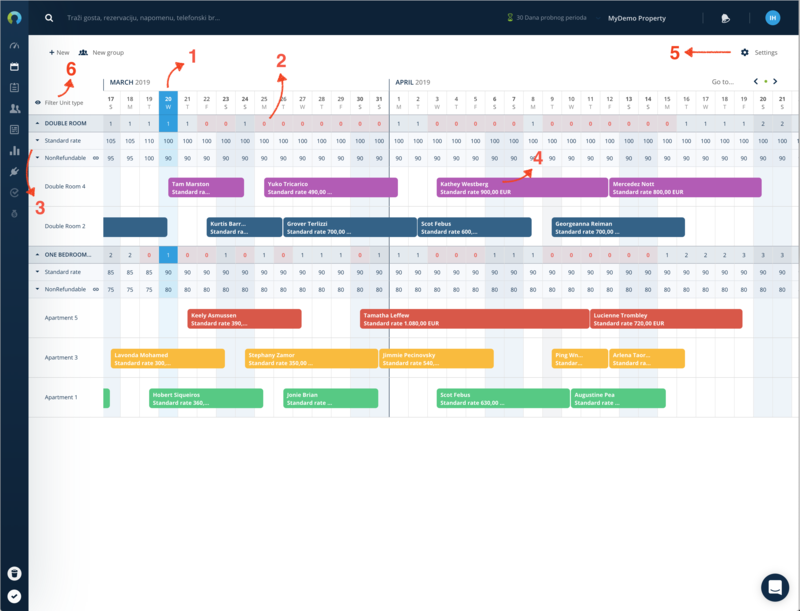 Past reservations, future bookings, and current reservations are marked with different colors. Reservation can be positioned in the middle or at the beginning of a date box. Also, you can choose a rhomboidal reservation shape instead of a rectangular one. If turned on, the new payment status option will allow you to see if reservations are paid directly from the calendar. Once a reservation is marked as paid, a green border will appear on the left edge of the reservation. Turning off raster will simplify your calendar view in case you’re not a fan of tabular view. Decide which restriction rules you want to see within details of a particular rate plan. Probably the biggest innovation in this update is that from now on you can manage multiple rates directly from the calendar. Until now it was only possible to manage Standard rate and Minimum stay restriction - but now Calendar allows a whole new specter of possibilities. What happens to additional rates and rules which were created on users’ request manually by the support team during the initial connection setup (e.g. setting up Non Refundable rate linked to Standard rate)? 👉There are no changes to it, everything stays the same as it was until now. New calendar shows Standard rate with additional restrictions which were not visible before. Everything else remains the same. What do I need to do for my calendar to show all the rate plans I have created on online channels and which I want to manage directly via Rentlio? 👉In order to see all active rate plans in Rentlio calendar, it is necessary to set up those rate plans in Property Settings within Rentlio. After you create the rate plan and define its rules (e.g. creating a rate plan linked to Standard rate with a decrease of €10) it is important to contact us via Support chat so we can remap that newly added rate plan with the OTA channel/s of your choice. 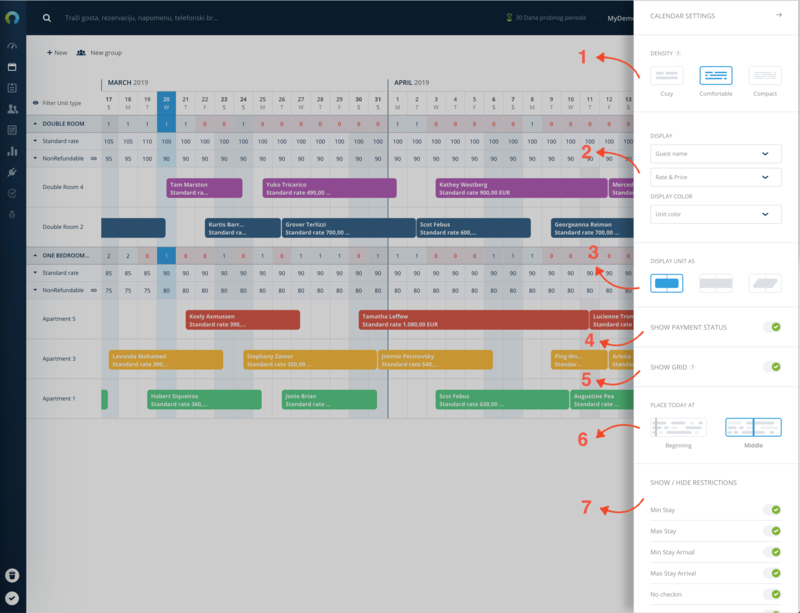 After the rate plan is remapped, you will be able to manage it directly from the Calendar with all its values, restrictions and interrelations without the need to contact our support team. By clicking on the arrow beside the name of the rate plan, you will see all restrictions that can be managed directly from the calendar which concern that particular rate plan. Beside Minimum stay restriction, from now on it is possible to manage Maximum stay restrictions, Minimum / Maximum length of stay and No check-in / check-out restrictions. All created rate plans can be seen below Standard Rate, and if the rate plan is linked to another rate plan, besides its name stands ‘link’ symbol. 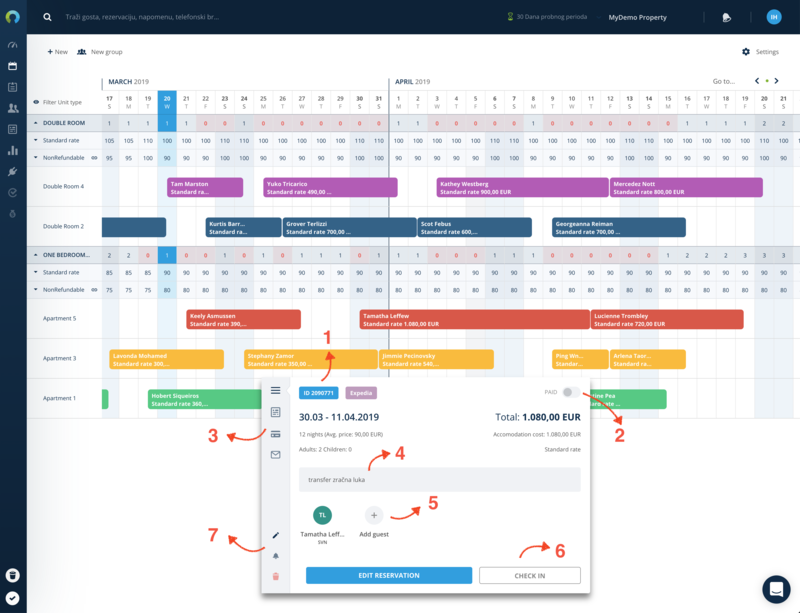 In this particular example on the photo above, the NonRefundable rate plan is set to be linked to Standard rate so that the NonRefundable price is always €10 lower than the Standard Rate in Rentlio Calendar. Pricing settings and restrictions on each individual price plan can be changed by marking one or more fields on the calendar. After fields are marked, on the right side of the screen, a new window will pop up where you can define which changes you wish to make. When defining prices, besides the usual setting of a new price for a certain period, now you can increase or decrease price in relation to the current price setting for a certain percentage or absolute value. Just like it worked until now, clicking on the reservation will open a small pop-up with all the reservation details. Besides adding new useful info to the pop-up we have also upgraded pop-up's features as well. Payment status of the reservation - once the guest has paid all its reservation expenses, now you can mark this in the small pop-up. The reservation will then get a green border on its left side which will enable you to see, just by scanning through your Calendar, which reservations have outstanding charges and which ones are fully paid. The logic of the paid Status will be improved in our upcoming releases as we are planning to connect the status with issued invoices which should additionally optimize this process. 3. Main navigation within the small pop-up. Allows you to quickly see the list of invoices/offers for this reservation, you can retrieve the credit card information or see all the email templates that were sent to the guest. 4. Guest request/note which was left when booking the accommodation at your property is now especially highlighted and can no longer be edited. For the internal remarks for your team members, we have developed separate functionality described in point 7. Up until now, there was a problem that internal remarks were mixed with the guests' notes which was not practical. 5. We have enabled the option to add additional guests to the reservation directly from the pop-up itself. 6. Besides the dashboard, check-in / check-out can now be done directly in the small pop-up. 7. Part of the navigation for adding internal notes, reminders and reservation cancellations. If you wish to leave the note that is relevant only to you and your team members, you can now do it by clicking on the pencil icon shown in the picture. That internal note will be separately displayed on a small pop-up and will not interfere with the guests’ notes. Additionally, from now on it is possible to create a reminder regarding specific reservations by clicking on the bell icon. Up to now, the reservation edits were made within the large pop-up window that opened at the center of the screen. This central pop-up is replaced now by the right sidebar window. To all of you who read this extensive article all the way down to here, there goes a patience medal 🥇. A special medal goes not only for your patience while reading this article but also because we know you have been waiting for these upgrades for a long time. We also know we missed deadlines set by ourselves and we are very sorry for that. Please accept our apologies! 🙏We gave our best to release these upgrades during late January / early February but we didn't make it. With each step further into the development, things were becoming more and more complex. We were very aware that hurrying with the release is potentially much more dangerous than missing a deadline.